The government of Uttar Pradesh has finalised discussions with the South Korean government for the construction of the Queen Hu memorial park in Ayodhya. According to reports, A high level South Korean delegation is scheduled to visit Ayodhya during Diwali celebrations and the construction of the park will begin before their arrival. Queen Hu, according to legends, was a princess of Ayodhya named Suriratna, who had travelled to Soth Korea in 48 AD to marry King Suro of Geumgwan Gaya. The princess is believed to have travelled to Korea by sea. After marrying the king, she was known as Queen Hu Hwang ok. Together with King Kim Suro, they founded the Karak dynasty in the region that is the present Gimhae province of South Korea. Cool. And with K-pop becoming so popular among teens today, may even revive their interest in Ayuttha, who knows? Lol. What legal hurdles ji? Just curious only. Hopefully it ain't another excuse to do nothing only. Yawn. So, once again, how better to end this auspicious Diwali day than by silently thanking our stars Yogi ji is there for us. Whew. 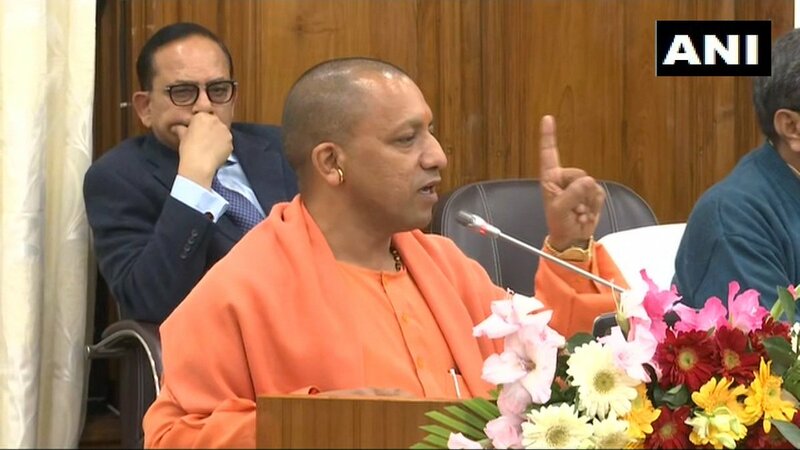 “There’s nobody in the country who would not give Ashfaqulla Khan, Abdul Hameed and APJ Abdul Kalam their due honour, but we will have to decide whether Ghazni, Ghauri, Khilji, Babar and Aurangzeb deserve any regard,” said Yogi. But how does Yogi Adityanath think? What is the ideological framework he operates under? Today, we shall make an effort to decipher the motivations that drive the Warrior Priest. It is well known that Yogi Adityanath’s preferred mode of defence, is attack. He has demonstrated time and again that he will not back down from a challenge and perceives as his duty to ensure the continued survival of the Hindu civilization. During his interviews, during the election campaign for the Uttar Pradesh assembly elections and after, he has made no effort to hide his ideological inclinations and is completely unapologetic about the actions he has undertaken to fulfill ideological objectives. The central theme of Yogi Adityanath’s worldview appears to be his perception that the Hindu civilization as we know it is under threat from forces both within and without. An article on his official website titled ‘Hindus in danger’ states, “If we Hindus are to survive, then we must become aware, we have to recognize the forces that threaten our existence and we also have to identify our own strengths.” He goes on to warn. ...]][He asserts that for as long as Nepal has existed, it has always been a Hindu country. And the attempts to secularize it was being made by vested interests as the country’s official designation as a Hindu Rashtra under a Hindu Monarchy was making it difficult for communists, Islamists and Christian missionaries to function freely. Yogi Adityanath asserts that Islam is a source of inspiration behind acts of terrorism. “There’s a section of Indian people who object when Islam is associated with terrorism. They call it a conspiracy to malign the religion. Aren’t they aware why not only in India but all over the world, the number of people killed in the name of Islam and Allah keeps on increasing? Why is the sacred land of Bharata being reddened with the blood of innocents? Why are innocent Hindus murdered on a daily basis? Why have Hindus been completely wiped out from Afghanistan? Why is it that the extermination of Hindus in Bangladesh is in its final phase? Why were Hindus wiped out in Pakistan occupied Kashmir? Why did the Kashmir valley turn anti-India as soon as Muslims became the majority and Hindus were wiped out?” The Yogi doesn’t buy into the idea that people are taking to terrorism due to lack of employment opportunities, according to him, there are some fundamental doctrines of Islam which inspire terrorism. Moi wept only, figuratively yes but literally almost. Only. Yogi also regards religious conversions as a conspiracy against the nation. “Dharma-antran is Rashtra-antran and is a conspiracy to destroy the culture of our nation,” he proclaims. His track record in the Parliament during his tenure as an MP from Gorakhpur speaks volumes about his commitment towards Hindutva. During a discussion on the 5151st anniversary of Bhagavad Geeta, he requested that the Book, Holy to Hindus, be declared a national book and be made a part of the school, secondary and university education. Where's the icon for "acute reverence", moi asks, hain jee?? He asked the government if it was aware that suspicious role of the Church was found behind separatism in the North East to which Minister of State for Home Affairs Kiren Rijiju stated there was no such report. He has also asked questions regarding activities of NGOs in tribal areas. He has spoken out against the communal nature of RTE Act as well and demanded that the then UPA government stop dividing the country between the minority and the majority. OMG.... I'll end up 'excerpting' everything only, seems like. Read it all, ye of a little faith! The_Yogi campaigning in chattisgarh apparently, due to popular demand. While it is a known fact that Lord Ram was born in Ayodhya, the matter is pending before the Supreme Court. Senior Congress leader Kapil Sibal had petitioned before the court that a decision should not been taken over the issue before 2019, he said. He said no day passes when at least two to three terrorists are not gunned down by security forces in Kashmir or surrender to the armed forces. Similarly, no day goes by where people in Naxal-affected states are not being provided complete security by the state governments, the senior BJP leader said. Addressing a poll rally here in Chhattisgarh on the last day of campaigning for the first phase of the state polls, he alleged that the Congress toyed with national security and actively and covertly supported Naxalism in Chhattisgarh and Jharkhand for political gains. Despite having extensive mineral deposits and forest wealth, Chhattisgarh remained “poor, backward and a BIMARU state” during the Congress rule, he said. BIMARU - an acronym formed from the first letters of the names of the states of Bihar, Madhya Pradesh, Rajasthan, and Uttar Pradesh - was coined in the mid-1980s to refer to the poor economic conditions within those states. “Today, the forest wealth is being used for the welfare of locals. The adivasis (tribals) and forest dwellers are being given benefits of development schemes,” the priest-turned-politician said. “The Congress encouraged Naxalism for its gains, but when it (Naxalism) became dangerous for the security of people, it was the BJP which had to deal with the issue sternly. The Congress has been encouraging Naxalism actively and covertly,” he alleged. “The Congress, for its own gains, played with the security of the country. Be it Chhattisgarh or Jharkhand, where the issue was giving asylum to Naxalites or using states like Kashmir for political benefits. But for the BJP, national security is of prime importance, hence (it) never accepted toying with it,” Adityanath said. That completes my aaj ka quota of Yogi noose. ^^^Good job. This is the kind of constructive PR needed as elections close in. Let us also not forget who put him in charge in UP so he can promote Hindutva on a very large scale. Thanks to him, most of the criminals who pitch in their followers on behalf of SP and Congis at election time have been "encountered." The opposition is in disarray and MGB is a pipe dream. A lot of these criminals are of the green kind and are hand in glove with the mullahs and poltoos, so getting rid of them is essentially Hindutva in action. Not much one can do as a Lok Sabha MP except book a spot for a fiery speech every now and then, and spend your measly constituency development fund. Mathura: The Yogi Adityanath government in Uttar Pradesh has done what could not have been imagined a couple of years ago: the state government on November 12 flattened seven Islamic ‘mazars’ (mausoleums or shrines) that had come up as encroachments around the holy Girirajji or Govardhan Parvat in Mathura. The hillock is considered holy by Hindus and has a special place in Hindu mythology. It is said that Lord Krishna had lifted the hill on just one finger to save the people of Braj from the wrath of Indra, the rain God, who had come to wreak havoc by incessant rains. Hindus from across the country come for doing ‘parikrama’ or circumambulation of the hill. Over complaints of encroachment and traffic mismanagement around the hill, the National Green Tribunal (NGT) had passed an order back in 2015, ordering the state government to remove all encroachments in the area. The order had come after an inspection had been conducted on March 20, 2015. The recommendations of the report, endorsed by the NGT, included designating the entire parikrama marg as a ‘no-construction zone’. “A drive may be carried out for the identification of forest land in accordance with demarcation map and all encroachments may be removed in a time-bound manner,” the report had said. Advocate Amit Tiwari, associated with the case in NGT, told MyNation that while initially, the list of encroachments did not include the seven mazars that had come up over time illegally around the hillock and near the parikrama marg, they were found in an inspection carried out recently. Wah^2. The wonders a full majority coupled with an unapologetic dharma-rakshaNa begets. Only. Somebody with big b@ll$ was needed and we have one. I have always felt that the NaMo+YA combination is a masterstroke in politics, one promotes Vikas - sabka saath etc, the other is unapologetically and systematically enforcing the law of the land, without fear of it being seen as pro-Hindu. Both are essential for the nation to progress and rise up out of the quagmire created by the previous regimes. The_Yogi doing ganga aarti at GaDmukteshwar. As part of its agreement with the NHAI, the UP government has promised that it will compensate the agency for the revenue loss incurred by it due to the exemption. Our lion roars closer to home today, in Bhagyanagaram wonlee. Using this dhaga, not just YAN news but for H issues in general. Would love it if Yogi ji champions this cause. Send a 100 of the best and brightest in UP's govt schools in each district to a Govt funded Hampi excursion every year. History and culture tour and all, onlee. And so on. Onlee. Here's the H content in the article for which I put this here - hope Yogi ji lends his support here too. And why not? Watch the 1-minute video linked in the tweet. Yogi Adityanath BLASTS Ajit Anjum left right & centre "Humne naam badle. AUR bhi badleinge. Jis se humari pehchaan hogi woh hum kareinge"
woh hum kareinge == that we will do. 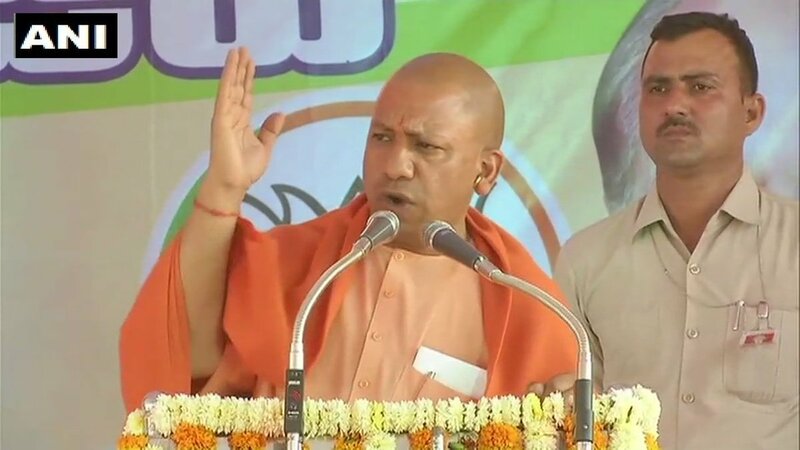 Yogi ji campaigned in 74 JanSabhas in recently concluded elections of three states.. BJP won a whopping 51 out of those 74 seats. P.S. Let nobody say that while vikas helps gain votes, Hindutva loses them. Not necessarily, clearly. Only. I also liked one more line of YogiJi, although 'communal': You keep you are Ali, we have Bajrang Bali. Wah rae wah. Dil mangae more. As millions of Hindu devotees are currently busy planning their itinerary for Prayagraj, the Uttar Pradesh government led by Chief Minister Yogi Adityanath is leaving no stone unturned to make 2019 Kumbh a bhavya (grand) and divya (divine) experience for them. It’s not just the scale of preparations that’s many times bigger than 2013, the government, in a Sisyphean sort of quest, seems committed to rise to the herculean challenge that is organising a Kumbh mela. How? One may naively ask. Well, in The_Yogi way. Behold. ...the state government has roped in services of 18 young professional management consultants on a contract basis. They are working with over 20 high-ranking government officials who constitute Kumbh Mela Pradhikaran (organising committee) and are helping them in employing technology on various aspects of governance during the mela. Bah, consultant-vonsultant you say? Details kahaan hain?? Chiefly, the government is using technology in four ways. First, to stop pilferage in civil supplies such as wheat, rice, sugar, kerosene oil, etc. During the mela, lakhs of people make Prayagraj their temporary home. To accommodate them, the government sets up a mini city, divided into many sectors, along the rivers Ganga and Yamuna. Then the government allots them land in sectors and gives temporary ration cards with which they can take their share of ration from fair price shops (FPS) which get the supply from mela godowns which in turn get their supply from Food Corporation of India (FCI). ...So, this time, the government has incorporated an inventory management system to ensure clear tracking of number of sacks coming to mela godowns and going to FPS. The earlier method of keeping track on thick registers and writing records manually is being replaced with a QR code system. Each and every sack of ration coming from the FCI will have QR code stamped on it which would be scanned at every stage, first at the godown and then at FPS as well. Jai ho. Jai ho, yogi ji ki. Second, the government is going full hog to make it a swachh Kumbh. It has installed 1,22,500 portable toilets throughout the mela area at regular intervals. But merely installing the toilets doesn’t necessarily mean that people will use them. Toilets need to be kept clean. There must be round the clock lighting especially in the dark so that they are easier to use. Majority of the toilets are installed by Lalloo Ji and Sons, a private company which has hired one sweeper to look after 10 toilets. For every cluster of toilets, there are five supervisors which ensure attendance of sweepers through mobile application by scanning QR code on ID cards of sweepers. The sweepers get paid Rs 295 per day. ... That’s not it. To add another layer of check, and to oversee the work of sweepers hired by the private company to clean its toilets, the government has given a contract to another vendor to ensure that sweepers are doing the job. This vendor has mapped each and every toilet and assigned its own force of workers to check if the toilets are being maintained properly. How? Its volunteers will carry out regular checks of toilets. They are armed with a mobile application which allows them to tick various options for why a toilet assigned to them is not working: is lighting proper inside the toilet, is it clean, or is it smelly, is water available, etc. See? Not just allotting money but following up, ensuring it gets spent right, the assets created are of quality; said quality is assessed for assurance and monitored; post-sale maintenance and service getting attention.... all this in the gubmint sector? That in UP gobmint? Whoddathunkit,. eh?? Third, the government is scaling up its lost and found initiative big time. But more crucially, using the technology to make the whole process much more effective. Earlier, there used to be just two centres in the whole mela area to report about lost items and relatives. There used to be serpentine lines of desperate people who would have lost someone outside these centres. These centres used to blare the names of lost people throughout the mela area creating unnecessary panic. This year, the government has not only increased the number of lost and found centres in mela area to 12 (and three coming up in the city) and increased their sizes, it has also made them digital. Three big LCD screens will be put up outside each centre. Public announcement will not be done throughout the area but only in and around the centres. Names and photos of lost persons would be beamed throughout the city on 36 screens. Now, one doesn’t need to stand in queue for hours to report about missing people, they can just do it via an app. Oh, read it all I say. In the meantime, my dil goes ummm-umm-ummm! P.S. Yogi ji amar rahe! yogi ji, tussi great ho! jai ho, jai ho, jai ho yogi ji ki!! 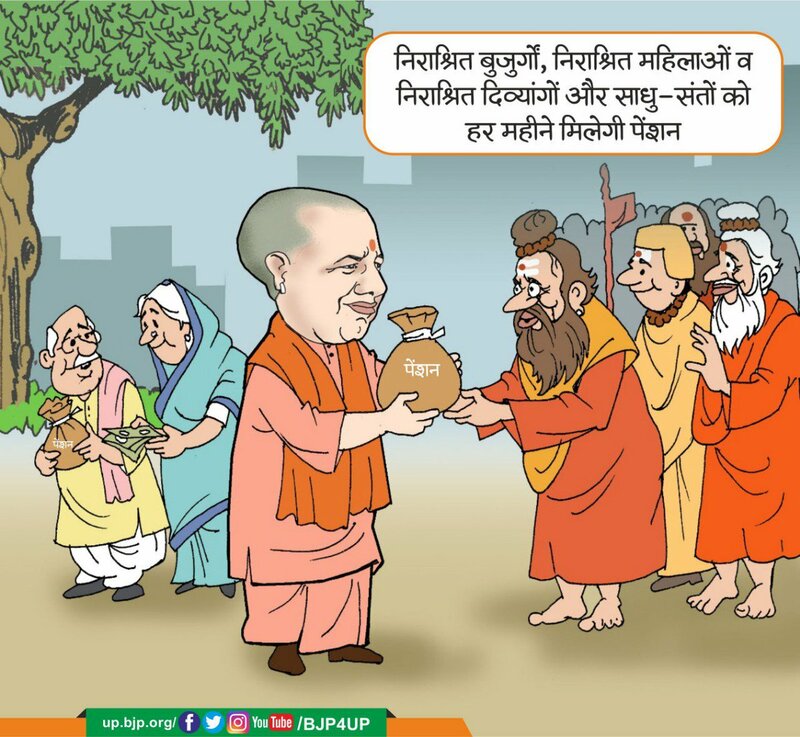 Translation: Un-sheltered ('niraasrita') elders and sadhu-sants (note: no paadres or moulvis) to get pension from UP sarkar. Yogyaay namaha! Goonj rahe hain teen hi naam, yogi modi jai shri ram! .....Third, the government is scaling up its lost and found initiative big time. But more crucially, using the technology to make the whole process much more effective. So no more hindi movies on twins separated in kumbh mela now. I heard they were going to use rfid tags (braclets) on children for easy traceability. E-FIR & avail of several other facilities through your mobile. Guys we all know how important Uttar Pradesh is going to be in the general elections. Especially with Priyanka entering the fray. To this end we created a video with public opinions really trying to showcase the success of Yogi Adityanath over the Kumbh Mela. In short the video discusses exactly how successful the Kumbh Mela this year really has been. Other successes by Yogi include the closure of all the illegal butchery places. Not only that but finally renaming Allahabad to Prayagraj were topics all taken up. In this view we got quite a few public opinions regarding his success and feel that this is an important feature to try and create over the next few months especially with general elections. Nobody wins as we know without winning UP. In any case, please take a look at the video below and as always like, subscribe and share. You can always send me feedback here or post or even via the contact link on the main India Aware website. On this video at least as well as the opening voiceover was done by me. ^ Awesome effort, Muns ji. Humble PraNaams from moi side. BTW, I visited the kumbh and took a dip on Magha PurNima 2 days prior. Impressive arrangements whichever way you look at it! I visited Kumbh and Varanasi last week and the few locals that I interacted with in both the cities were very happy with CM Yogiji and PM Modiji. Kumbh arrangements are by far much better organized than any previous Kumbh mela. The employment generated and the boost to the earnings of the locals is much appreciated by them and by their own admission they are looking forward to host the 2025 Kumbh mela. In Varanasi, locals are very happy with the cleaning of the ghats. Also there is support for the pathway being created to access the Kashi Vishwanath temple.